Thanks largely to a voter withdrawal from Republican ranks, DFLer Mike Hatch has an apparent edge over Republican Gov. Tim Pawlenty going into the last week before the Nov. 7 election, a new University of Minnesota poll shows. Hatch drew support from 45 percent of 663 likely voters in the telephone survey conducted Oct. 23 through Saturday, compared with 39 percent for Pawlenty and 9 percent for Independence Party nominee Peter Hutchinson. Undecideds made up the remaining 7 percent. There was more bad news for Pawlenty: His job approval fell from 56 percent in September to 50 percent, and positive marks from voters on the direction of the state declined from 48 to 44 percent. At the same time, interest in the election has surged among Democrats and barely budged for the GOP. "The Democrats are more fired up than the Republicans," Jacobs said. The Full report, in PDF, can be found here! From that reports, is this little nugget about vote switchers. Third, more than 1 out of 10 likely voters who currently support Pawlenty or Hatch may change their mind and support a different candidate. About half of Hutchinson’s supporters indicate a willingness to consider another candidate. The US defense department has set up a new unit to better promote its message across 24-hour rolling news outlets, and particularly on the internet. The unit would reportedly monitor media such as weblogs and would also employ "surrogates", or top politicians or lobbyists who could be interviewed on TV and radio shows. Mr Russ said the move to set up the unit had not been prompted either by the eroding public support in the US for the Iraq war or the US mid-term elections next week. So a subtle claim that this is not political. Is there any decision at all that is made in Washington that is not political. It will take a new governor for state government to become a more dependable ally of average Minnesotans with above-average aspirations for themselves and their state. Pawlenty demonstrated with his first budget that he was willing to run up the price of a college education, deny poor families child care, slap a surcharge on nursing home residents and take away health insurance from the working poor, all to adhere to a "no new taxes" campaign pledge. Two years later, with the veto of a forward-looking transportation bill, Pawlenty dashed hopes that the state would make a serious move anytime soon to ease serious transportation woes. Hatch knows meeting that challenge starts with access to high-quality education. A cut in college tuition is one of the few promises he's made. While we'd prefer more need-based student aid, Hatch is on the right track. Next on Hatch's to-do list is access to high-quality preschool for low-income children. He understands that investing in the very young may be the best way to close a widening economic gap between rich and poor. Hatch is clearly the best person for the job. Middle class Minnesotans need an ally in the Governor's Office and it has been clear over the last few years that TPaw is not on our side. I'll be saying good bye to Mike today. I found out last night I will be delivering one of the eulogies. I hope I can make it through. After the service, interment, and luncheon; Clive, Johny, and I are going ahead with our trip. Mike would have it no other way. I'll post my words here, when I get home from the service, and then it will be off to Iowa. Full political sniping will commence in full force Monday, for the final push to Election Tuesday! Tim's a likeable guy, but my patience have run out. I need a fighter. My property taxes are skyrocketing, fees are becoming unmanageable, and I am not getting any return. Roads are a mess, schools are suffering, and public safety is at risk. All because of a pledge to a small special interest group. No Tim, the state is not on the right track, and someone needs to come in and fix the mess. That person is Mike Hatch. I'll be spending a lot of time next week talking about our next Governor, Mike Hatch. Of all the key races on the ballot this year, this one is evolving into the most important of them all. Senators and members of congress are one voice of many, the governor IS the voice of many, and the lead administrator of the state. They are the one with the greatest impact on my pocket, and the future of my children. We've seen what happens with four years of TPaw, and frankly, it will probably take more than four years to fix it. But it starts with effecting change, and THAT change agent is Mike Hatch. I like Betty. She is a GREAT fit for the 4th district. She will win her race hands down. However, it is difficult for me to unconditionally support someone just because of party ID. When Betty opted to hop on the Patty Wetterling bandwagon in the face of a qualified and competent candidate like Amy, she lost me. Obi Sium is the GOP Endorsed candidate. I've had an opportunity to meet him and visit with him. He is the only other candidate (Robert Fitzgerald has been by twice) who has visited the ole garage. Nice guy, likable, rudimentary handle of the issues, just doesn't have the grasp of the reality that is the US Congress. Nope, I can't hop on board either campaign at this time. There is no IP candidate to choose from. Another perfect race where the Independence Party could have not only helped themselves, but helped the up ticket 'Minnesota Team'. That kind of showing could cost the DFL, but if the Independence Party wants to play in the big leagues, they need to run competent and qualified candidates in all congressional races. Tammy Lee has shown how viable a moderate candidate can be in an inner city race, why did they let the 4th go. So I have decided to endorse the only person I know, in the 4th district who matches me perfectly. An ideological clone, a mirror of my mind, and someone who I have full manipulative control of. That person is ME . . . write-in Kurt 'Flash' Schiebel for 4th district congress! Fanaris, Michael W. age 42, of Champlin. Published in the Star Tribune on 10/25/2006. UPDATE: I haven't mentioned that Mike's stepson Joshua did a tour in Iraq. Was hit pretty hard with an IED and is still recovering. He is a Proud Purple Heart recipient. It is amazing that Michele Bachmann even got the GOP endorsement. She is a far Right candidate with views on religious involvement in government and marriage so far on the fringe some Republicans are having a difficult time supporting her. She was the only candidate of those pursuing the nomination that would open the door for a credible Democratic challenge. And that door is wide open now. Patty Wetterling is by far the best candidate to represent the 6th of the current choices available. Patty's determination and drive will rub off into other areas involving social justice. She will be a voice of reason within a congress that can be too wrapped up into a political frenzy that some may forget why they are even there. Patty will never forget why she is there. I did consider the IP candidate, John Binkowski, as a possible alternative. But electability is as much a factor as principle. In a race like the 6th, Bachmann simple must be stopped, and a vote for Binkowski would not serve that purpose. This choice was clear, whether it is a vote against the opponent or not. But religion needs to take a back seat to politics, or the problems we are experiencing will magnify. Besides, isn't there something in the Constitution about separation of church and state, or does the party in power think the Constitution should be cherry picked for political purposes. I'm really beginning to think they believe that. As long as I have managed to tick off a swath of the far left fringe of the DFL, I may as well get this one out of the way. I made a commitment to myself that I would evaluate each candidate, and support the more moderate of them unless there was a compelling issue or even an electability concern. In the third, it is clear who is the more moderate candidate, and his seniority will continue to be of value to his constituents. That person is 3rd district Congressman James Ramstad, and this left leaning moderate has no problems endorsing him. Look at his record. A true moderate who is strong on the Arts, and Animals; tight with the purse strings, and isn't afraid to cast a vote that may go against his party's leadership. Ramstad received a 100% rating from the NEA in 2005, a rating shared by more Democrats than Republicans. Ironically, some of the issues we differ on are where he moderates to the Left, like Gun control. But we must balance out all stances one has on the issues and support the candidate who most closely mirrors our own personal views. In this case that answer is clear, Jim Ramstad. Michael Wayne Fanaris was a loving man who cared deeply about his children, lived to succeed and was passionate about hunting. Fanaris, 42, of Champlin, Minn., died Monday morning while hunting in a remote area of California Park north of Hayden. Routt County Deputy Co­­roner Mitch Locke said Fanaris died from heart failure. He does not believe Fanaris had any pre-existing medical conditions. Autopsy and toxicology results did not show any drugs or alcohol in Fanaris’ system at the time of his death, Locke said Friday. Fanaris’ death most likely was due to the altitude, he said. Kurt Schiebel, a longtime friend from Minnesota, said he remembers Fanaris as extremely hard working and a loving father to his three children. Schiebel met Fanaris 20 years ago while the men were working as mechanics. Fanaris later became a computer programmer, Schiebel said. The men were part of a group of friends that did everything together, including hunting. Locke said Fanaris died at about 6:30 a.m. Monday after he and a couple of other hunters ate breakfast and were preparing to go out into the field. As you can imagine, the last few days have been somewhat surreal. Lots of phone calls, lots of tears, lots of memories, lots of internal reflections. Mike was a dear friend, part of a 4 person posse I guess you'd say. Clive (The Doctor), Johnny, Mike, and myself would do many things together. Wednesday evening we tried to recreate some of those things in Mike's honor. My wife and I met up with Clive at Rock Bottom for dinner. Clive and I then went over to Johnny's later to watch some fishing videos of Mike that Johnny had in his archives. As the evening got late, we opted for Breakfast at Flameburger, and all of us ordered Mike's favorite Ranch Breakfast. Alexis DeLaCruz of the Steamboat Pilot & Today helped fill in some of the gaps to Mike's last moments in her article on Wednesday. I spoke with her briefly today to find out some more details, and learned she was doing a follow-up article later today or tomorrow. Hopefully the local newspapers will pick up on her stories and share with the local community the tragedy we are experiencing and the fantastic father and friend Michael was. Details are still pending, and I will post that information here, along with a link to Alexis's follow-up story, when they are available. Hopefully I'll be back to regular posting next week. 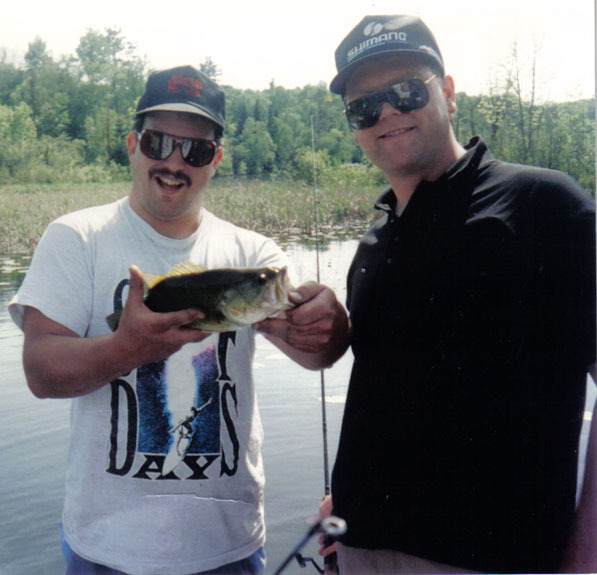 Here is a picture I took several years ago when Clive, Mike and I where up in Bemidji Fishing. That's Mike on the left showing off his recent catch. I sensed in my wife's voice that something was up. While at the debate I didn't hear my phone ring, but when I left I noticed a message. The message, from the lovely Mrs. Flash, sounded stressed. I'm thinking 'What did the boys do now?' I called her back and she insisted that the boys were fine, nothing was 'wrong' but that I needed to hurry home because the neighbor was waiting in the garage. So I did. Turns out my senses were spot on. Soon after I got home, she told my about Mike. Presently his marriage of almost 20 years was all but over and his kids grown. Mike had taken up flying and was a licensed pilot. He also loved to hunt. Next weekend we were all going down to Iowa for pheasant opener, a trip that will have one less passenger. Mike was down in New Mexico Colorado this week, big game hunting. While out in the field, with his guide, he dropped of a heart attack. The guide did his best to revive him, but he didn't make it. An autopsy will be performed in hopes of finding some answers. Mike was in his early 40's, relatively fit, non smoker, light drinker, no drugs, Triathlete (#294, #263), 3 times a week at the 'Y'. Seems like he was doing everything right. You never know when it is your turn, and after Joel passed last year, I had already had an eye opener, but now Mike. Next weekend's hunting trip will take on a whole new meaning, and you can bet we'll be sharing many stories about our good friend. A couple of my endorsement screeds will have to wait a day or two. I lost a big chunk of my blogging time last night. I am sure you all understand. God Loves ya Mike, and you will be deeply missed. He said his search crews are weary after being called out Sunday by a report that a hunter had been found dead in the remote backcountry of northern Routt County. That hunter was identified as Michael Wayne Fanaris, 42, of Champlin, Minn.
"The coroner suspects a heart attack, but that'll be determined by the autopsy,"' Warner said. Steamboat Springs — A hunter who died Monday morning in a remote area of California Park has been identified as 42-year-old Michael Wayne Fanaris of Champlin, Minn.
Routt County Deputy Coroner Mitch Locke released the man’s information Tuesday morning after speaking with the man’s family. The man’s cause of death is still unknown, but does not look suspicious, Locke said. An autopsy most likely will be performed Wednesday to determine the man’s cause of death, he said. A toxicology report also will be prepared, though it does not appear drugs or alcohol were contributing factors in Fanaris’ death, Locke said. Fanaris most likely died around 6:30 a.m. Monday while hunting with two other people north of Hayden in California Park. Fanaris was hunting with the Craig-based outfitting company, Beaver Creek Outfitters, officials said Monday. The death was reported around 7:30 a.m. after outfitters with the company were able to get to the Kum and Go in Hayden and call 911. Locke said he pronounced Fanaris dead around 5:45 p.m. Monday at the outfitter’s staging area near Armstrong Creek. I never received so much preasure to 'tow the party line', than I have on this race. This decision wasn't about race or religion, it was about political ideology. I respect and honor Mr. Ellison's candidacy, and he may be the 'best fit' for the district. But he is considerably removed from my moderate left of center stance. Tammy Lee is a fiscal conservative that is socially progressive. In an E-Mail exchange the other day, she stated to me that she has "committed to caucusing with the Democrats in Congress, but will cross over to vote on some small business issues and economic development". But I didn't stop there, I went to the debate last night. To date, none of the DFLers has captured the imagination of the few paying attention to their primary race. And Fine seems to be a Republican from a more gracious time. Somewhere between a recital/rally he held at the Varsity Theater in Dinkytown a month ago and Keith Ellison's Tuesday night victory in the DFL primary for the Fifth District seat, Fine changed keys. In the process, he lost any claim to moderation, thoughtfulness or originality, which were just a few of the attributes I poured on him. Asked how the United States could "finish the job" in Iraq. Ellison said, "We need to have a discussion about: What is the job?" Pond said the job was "the first attempted privatization of an entire country. It failed. We did not get the oil." Lee said the United States needs a pragmatic plan to bring the troops home and to keep "our obligation to rebuild Iraq." I was dissapointed at Mr. Ellison's dodge of the question. Although Tammy Lee's answer wasn't quite what I was hoping to hear, she at least answered the question, and recognized our obligation and commitment to leave Iraq in a respectful and responsible way. I encourage anyone in the 5th district to take a second look at Tammy Lee's candidacy, and decide for yourself if she is a better fit for you and your political ideology. She is for me. I bright blue slate for you, today. But that is where you find Moderate Democrats in this state. Tomorrow will be a different story, as the Dems move to the far Left. I've met Tim Walz. I was impressed by his sincerity, his desire to serve, and his desire to serve again! Tim's a bit further left then I, but considering the alternative, I have no problem supporting his candidacy. Of all the congressional races in Minnesota, this is the sleeper. I believe this race is the best chance for a pick-up opportunity, with the 6th not far behind. This was one of the toughest calls of the bunch. Initially, I was excited abut a Rowley candidacy. Strong moderate cred, an FBI operative, and the courage to stand up for what is right, regardless of the potential life changing consequences. You have to admire that in a candidate. But then she hit the campaign trail and I softened on her considerably. John Kline is an extreme conservative, and may be a better fit for the district. But I think the voters of the 2nd would be better served and better represented by someone with some moderation. That person is Colleen Rowley. Collin Peterson looks more like a Republican then a Democrat. And frankly, that is the only way a Dem can win in the northwestern part of the state. Peterson's Pro-Life stance and tight purse strings are important to 7th district voters, and explains why he has had such electoral success in this red district. Peterson is a Democrat even Swiftee could warm up to, but I am comfortable in endorsing Collin anyway! The seniority leader of the Minnesota Congressional contingent is James Oberstar. First elected back when I was in Junior High, James has made his mark. Rob Gramm's candidacy seems more like a get 'out the vote' strategy for up ticket races, then a sincere run for congress. But Rod's ideology is way to far Right for me. This is Oberstar's seat, until he decided otherwise. So there you have the outstate congressional seats. The red/pink nature of these agricultural areas tends to produce moderate Democrats and far Right wing Republicans. I'll take some lumps today for endorsing a clean sweep of Blue candidates, but those same people will be hard pressed to defend the moderacy of any of the Republicans in those races. Tomorrow we'll have the metro races, where we see the DFL Endorsed candidates much further Left of their outstate counterparts. In those races, I will be endorsing only one of them. You'll have to wait till tomorrow to find out who it is, and who gets the coveted Centrisity endorsements instead. It's endorsement week at Centrisity. I am still undecided on a couple races, but I think I'll be able to lock everything in by the end of the week. I'll begin tomorrow with the outstate congressional races, working my way towards the cities and ending with the statewide slate. I will be endorsing candidates based on how closely they match my moderate ideology, which means it won't be straight party line. Although on the statewide level, that looks more and more the case. There might be a few surprises, or there might not. I'll leave that up to you to decide. Watch two of the three major party candidates on Meet the Press this AM (CH 11) I'll link up the transcript on this post once it is available. I suspect the GOP candidate will be quite animated after another poll is released showing him in electoral dire straits. Lifelong Republican Marvel Carstenbrock, 79, of Austin, Minn., said she plans to break ranks and vote for Klobuchar, although she also supports Pawlenty for governor. "I like that Amy Klobuchar," Carstenbrock said. "She's a good gal. She seems like she'll work hard." As for Kennedy, she said, "I am sick of that guy and his negative commercials. I wish he would just say what he wants to do." When will Mark get it?!? UPDATE: Boy, was Kennedy ever off his game. It almost seemed like he has totally given up. There was minimal if any actual engagement by him as he stuck to his talking points even when Tim caught him in the various fabrications Kennedy is trying to push. Amy showed the type of leadership we expect in a Senator. She displayed a clear stand on the issues. Yet has the willingness to keep everything on the table as more information is gathered so one can make the best decisions possible in representing Minnesotans. MSNBC will be replaying Meet the Press later this evening (5:00 PM, 9:00 PM, and Midnight) See for yourself. It Worked Until He Broke It! Little more than four years ago, the North Korean nuclear weapons program was largely under lock and key, the threat seen as a fleeting crisis of a previous decade. North Korea's main nuclear center at Yongbyon, 60 miles north of Pyongyang, was monitored 24 hours a day by U.N. surveillance cameras. International inspectors lived near the site. Seals were in place over key nuclear installations and a nuclear reactor at Yongbyon was gathering dust. And now all of a sudden people are saying, the Bush administration ought to be going alone with North Korea. But it didn't work in the past is my point. The strategy did not work. I learned a lesson from that and decided that the best way to convince Kim Jong-il to change his mind on a nuclear weapons program is to have others send the same message. Democrats and Republicans have been arguing over who was responsible for the buildup in the North. Madeleine K. Albright, a secretary of state for former President Bill Clinton, issued a statement on Wednesday defending his administration and striking back at Mr. Bush. All that changed when George W. Bush became president. Bush quickly made public his loathing for Kim and the regime. Republicans were particularly scornful of the agreement to give energy assistance to North Korea and looked for ways to void the pact. The opportunity presented itself during the first visit by a Bush administration envoy to Pyongyang in October 2002. Assistant Secretary of State James A. Kelly was told by a North Korean official that the North was cheating on its nuclear freeze obligations by conducting secretive research into highly enriched uranium. As fuel for a nuclear weapon, highly enriched uranium is an alternative technology easier to keep hidden than a plutonium-based program, which requires a reactor such as the one at Yongbyon. The Bush administration moved hastily to punish North Korea by cutting off shipments of fuel oil that had been pledged under the Agreed Framework. Within weeks, the North Koreans put tape over the surveillance cameras at Yongbyon and broke the seals on their nuclear installations. By New Year's Eve, the U.N. inspectors were escorted out of North Korea. And there's your timeline, whether you like it or not! 83, Minnetonka, retired truck driver: Paulson has voted Republican most of his life -snip- But he's "not a Bush fan," he said. "I really think he's let this nation down with this war [in Iraq] and I blame the Republicans in Congress for sticking with him on this fiasco." -snip- As for the governor's race, Paulson is a bit irritated that his property taxes went up 15 percent this year. "But I think [Pawlenty's] doing OK. He seems like an honest man and a good character." 44, Plymouth, part-owner of a construction company: ... It's never been a good idea to have the government totally controlled by one party." 37, Brooklyn Center, manager of a circuit-board shop: Although for now he's leaning toward Pawlenty, he doesn't like his negative TV ads, and might vote for DFL candidate Mike Hatch or Independence Party candidate Peter Hutchinson. 45, Braham, agricultural products salesman:In the Senate race, he likes the looks of Klobuchar's record and doesn't like "the mudslinging that Kennedy's doing. She's maintaining the positive and I don't know what he's trying to do, but it's not working." 60, Owatonna, special education paraprofessional: "In the case of Mark Kennedy, I see him on TV and just don't trust him. I can't put my finger on it." The theme that resonates to me, is that amongst these admitted Right leaners who are sticking with TPaw, all are bailing on Kennedy. The attack ads, as one might suspect, are backfiring and have turned Kennedy into a scoundrel, rather than a Senator. Even the Park bench ad makes Kennedy look like a bully. Mark will have plenty of time to think over the many mistakes his campaign has made over the last year or so. But one thing he needs to remember, is that this is Minnesota, and if you don't play nice, you'll find yourself in trouble. The blogosphere is abuzz with the usual solutions -- bomb them, nuke them, invade them, bribe them, send them flowers, blame Clinton -- but let's disregard those. This is reality, not a video game. And reality, in this case, is messy. he then breaks down the various options and their ramifications, including; Is there the will and capability to attack NK?, Assassination?, Bombing?, Invading?, and Sanctions? It's a pretty fair look at what lies ahead. Give it a read! Rasmussen has publicly released their Minnesota numbers. A bit different then what Pollster had the other day. Witness the bump I talked about the other week. Only a moment in time, of course. I copied the whole thing, because you need to read the whole thing. Probably the best local political show on the air is 'At Issue' with Tom Hauser on Channel 5. This week was no exception. The candidates for Ramsey Country Sheriff sparred over who was more involved in what kind of illegal activity. Fletcher for domestic abuse or Finney for selling a gun to a criminal. Both accused the other of lieing, both claimed the other was misrepresenting the facts of their situation, both remained cordial but clearly irritated, both were looking forward to getting out of there. The clip isn't up yet, but you'll find it at this link once it is. At 10:00 Sunday morning everyone should be watching Channel 5. Even Strommie is on for a bit. UPDATE: Its up now. Here is the direct link to the video. Polls are just a picture in time, but what a pretty picture it is! We may never see such a well-qualified pairing again for Mayor of Brooklyn Center. I know I have never had a more difficult time in any city election, having to choose between Kathleen Carmody and Tim Willson. I know and respect them both. But a number of small indicators, including their performance on a televised debate tonight tell me that Willson is the better choice to meet the challenges and opportunities of our first ring suburb. Yes, I'm crossing over to the dark side on this one. But it's going to take a little bit of Darth Vader to restore order, cooperation, and civility to the City Council. Having served with Willson on the Planning Commission for nearly ten years, I know he can be the strict parliamentarian required. I commend you for taking the time to consider both qualified and competent candidates and making a decision based on what you feel is best for the city, regardless of Party affiliation. Isn't that how the electoral process is suppose to work. It's not so much who he picked, but that he took the time to look at each candidate, acknowledge their strengths, and make a decision based on who can bring the best to the table to move the City forward. I wish everyone would do that for all the races, instead of getting wrapped up in partisan bickering. It is still a nail biter. With only about a month left to go, both Electoral Vote and Rasmussen have the Senate at 49 - 49 with 2 races deadlocked. The two most stubborn senate races, New Jersey and Missouri. The most surprising development is the movement of the Tennessee race, I believe Frist's current seat, is now a Leans Democrat with the support for Dem Candidate Harold Ford growing. Virginia may also be in play with the remaining GOP seats in pretty good shape, for now. The Dems may look in better shape, but in reality, according to the Rasmussen chart, they have only secured 40 of the needed 51 seats to retake the house. The remaining 9 are considered 'Leaners'. So to take the Senate, Dems must lock in all 9 leaners AND both tossup states to capture control. There's about a month left, and still time for anything to change the direction of these races. I may have been one of the few people hoping for the Yankees in the first round. It would have virtually assured us Prime Time night games. But I'll take the A's. I will be pretty busy today, so won't be able to catch much of the actions, but MLB.com has the best way to keep tabs on the afternoon's opener for those without a TV or radio handy. I just may have to take a late lunch. I don't know what I am more disgusted with, that a ranking GOP congressman abused his trust by seducing minors, or the fact that the Congressional GOP leadership helped him cover it up. There are several quality local blogs out there covering the various scenarios, so I won't be one of them. I am wondering, however, if our local candidates with the dirty money will follow the lead of their peers. Among Republicans disposing of Foley money were Virginia Sen. George Allen, who plans to give the $2,000 his campaign received to a charitable cause, and Rep. Heather Wilson of New Mexico, who plans to give away $8,000 she received between 1998 and 2002. Rep. Clay Shaw, R-Fla., already donated $2,000 to the National Center for Missing and Exploited Children, and Rep. Nancy Johnson, R-Conn., returned $1,000 she had received from Foley's political action committee. Rep. Deborah Pryce, R-Ohio, a member of the Republican leadership, returned $5,000 to Foley's leadership PAC on Friday. Rep. Curt Weldon, R-Pa., returned a $1,000 contribution as well. Reps. Jim Gerlach, R-Pa., and Geoff Davis, R-Ky., donated the $1,000 they each received from Foley's PAC to victims' advocacy organizations in their respective districts. I won't hold my breath on that one. US Senate candidate Robert Fitzgerald is sending out a plea to his supporters to contact Meet the Press. This campaign is involved in every U.S. Senate debate in Minnesota. Meet the Press is conducting a debate with the U.S. Senate candidates on October 15th, but with one glaring omission. I have yet to receive an invite to the debate. The campaign and the party have been pressing hard, but now is the time for you to email the producers of Meet the Press and insist that all three major party candidates participate in the debate. Let Meet the Press know how important it is to hear from the three major parties here in Minnesota. He has a point. Although I am supporting Amy for this race, there is no reason that Meet the Press should omit the third major party candidate in the state. So take a moment and jot them a note to ask that Independence Party Candidate Fitzgerald be included in this debate. It's a long shot, but certainly worth a shot. The Miracle season has taken another step. After clinching the Wild Card, and dominant performance by the twins, coupled with another Detroit Tiger collapse, clinches the division. Next up, those Pesky Oakland Athletics!